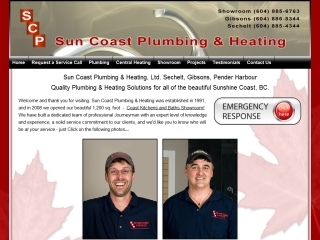 Sun Coast Plumbing and Heating is a full Service Plumbing and Heating company on the Sunshine Coast of BC. We serve Sechelt, Gibsons and all the Sunshine Coast, BC. Visit our Sunshine Coast Kitchen and Bath Showroom. Quality Work and Great Service Guaranteed.